The siberian husky (commonly known as the husky) is a medium sized dog breed which originated in Siberia. The husky is a working dog breed and is famous for their ability to withstand cold temperatures and pulling large amounts of weight across difficult terrain. Although the need for sled dogs today is not as vital as it once was, there are many events which use huskies to re-trace the older sled routes in remembrance of the people and dogs that were vital to the wellness of isolated towns. Below are the details and specs for the Siberian Husky dog breed. Siberian huskies are medium sized dog breeds with adults weighing 35-60 pounds and standing 20-23 inches tall from ground to shoulder. Their compact size makes them easy to transport and perfect for any home environment (as long as it's not too hot). Huskies are great with children and other dogs. The breed should not be left alone with children unsupervised as they can easily get excited and knock down a small child. They do have a strong prey drive, due to the difficulty of finding food in the arctic, so they may see birds, squirrels, and cats as prey. However, many families claim their husky's are fine with smaller animals as long as they are raised around them. Huskies are high maintenance dogs in training, grooming, and exercise. They shed heavily and need to be brushed frequently to keep loose hairs free of their coat. Generally, the colder your home the less your husky will shed, but indoor huskies will generally shed year round. Huskies have a lot of energy and require moderate exercise daily to keep them from develop destructive habits to burn off their excess energy. They should be walked at least 30-60 minutes daily. The Siberian Husky history begins quite some time ago in Russia. 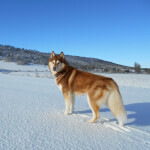 It is an ancient breed that, along with the Alaskan Malamute and the Samoyed, are descendant from the first sled dogs. The sled dogs that eventually became the Husky were domesticated by the Chukchi people in Siberia. In the 17th and 18th centuries, Russia sought to become a world power. This desire led the czar to send Cossack troops to Siberia to unsuccessfully subdue the Chukchis. The sled dogs allowed the regional natives to remain essentially untouchable. During this time, there was a different set of events happening just across the channel in what is modern-day Alaska. During the 1909 All Alaska Sweepstakes Race, the Chuckchi Siberian Huskies that had been used by one team had been noticed by racing enthusiast Charles Fox Maule Ramsay. The following year, 1910, he directed his team's top driver, John "Iron Man" Johnson, to use the dogs, and they won the grueling 400-mile race. The second- and fourth-place teams were also Chukchi Huskies owned by Ramsay, and this placed the dog on the world map. Just over a decade later, in 1925, a diphtheria epidemic all but leveled Nome, Alaska. Had it not been for a courageous battalion of some 150 Huskies driven by 20 mushers, the sickness may have all but wiped out everyone for hundreds of miles in and around the town. The teams were able to deliver serum that by no other way could arrive in time. The 675-mile route across barren, icy terrain was done in under six days, and a statue was erected in NYC honoring the heroic effort. During that decade, the USSR was plotting to politically destroy the dog. In 1930, exportation of the breed from Siberia was stopped. They renamed the breed the "Peoples Sled Dog," and in 1952, claimed that the Chukchi dog had never existed. They announced Russia was not where Siberian Huskies are from-- that this was a breed conceived by the U.S. that was in no way related to their dog. (To this day, many Russian dog "experts" cling to this bizarre view.) Nonetheless, Husky ancestors were acknowledged the world over as having come from a handful of dogs from Siberia. The AKC apparently countered by formally recognizing the breed in 1930. Other world-class kennel clubs followed suit: the UKC recognized the breed as the "Arctic Husky," and Canada registered the breed in 1939. In 1933, 50 of the dogs accompanied U.S. Navy Rear Admiral Richard Byrd as part of Operation Highjump to travel around the entirety of Antarctica. For a century or so, it was thought that the Chukchi Husky was no longer living in Siberia. 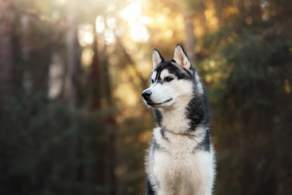 In 2006, however, an article by Benedict Allen in Geographical magazine claimed that the bloodline remained alive and well where the origin of the Siberian Husky occurred. The Siberian Husky is a medium-sized dog whose huge coat and happy personality will be obvious through the wolf-like appearance. They will have an alert look that may make them seem a bit wild but is most likely their way of waiting for that next snack. They have a slightly rounded head, triangular ears, and a long, pointed snout that should have a scissor bite. While most photos tend to be of blue eyed Siberian Huskies, they can often enough be brown or some other color, bi colored eyes. The body should be lean and somewhat long, with well-proportioned legs and a husky tail that curls around and down to the dog's back. The thick coat has one aspect that should be noted: it may come in one of more than 250-plus colors, and most any color may occur. 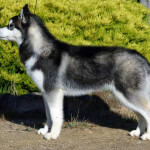 Because the Husky coat comes in so many colors, the AKC's standard allows for any color and makes it clear that this feature is the least important when judging this breed. 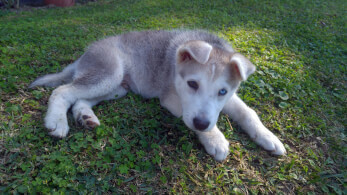 While most people may seek Husky puppies with blues eyes, there are no competitive faults regarding coat or eye color. Below are common siberian husky colors. Those wondering how big a Siberian Husky will get should note this: this breed has a huge amount of hair that makes the Siberian Husky size appear much larger than the dog under the double-coat. Male Siberian Husky weight ranges from 45 to 60 pounds, and fully grown females are much smaller, weighing in at 35 to 50 pounds. Regarding height, males stand from 21 to a little over 23 inches tall whereas females are just slightly shorter at 20 to 22 inches. 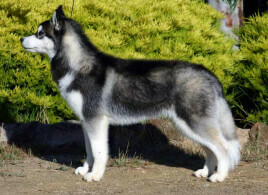 Although the AKC makes no mention of the Miniature Husky, this variation is a well-defined one. Some may call it a "Teacup Husky" or a "Toy Husky," but they are all basically one thing: a small Husky whose size is well beneath the accepted breed standard. 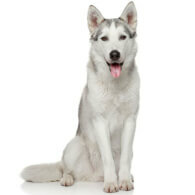 This companion-sized Siberian Husky was produced in the 1990s by selective breeding. Seeking a Husky whose compact size would make the dogs more manageable, Bree Normandin bred those whose "little genes" were obvious. The result was a miniature Siberian Husky whose weight was around 35 pounds and which stood about 14 to 17 inches tall. These types of small Huskies should not be confused with the mixed breed that was conceived in the 1970s, the Alaskan Klee Kai, a crossbred dog produced from the Alaskan Husky, the American Eskimo Dog, and the Siberian Husky. Typically, the double coat of the breed consists of a fluffy undercoat and medium outer coat. 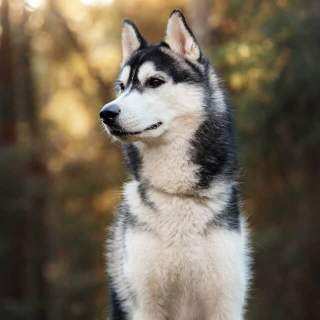 Husky fur variations also occur and there are long haired and woolly Siberian Huskies, however, this is not considered standard for registration and show dog purposes. The Siberian Husky temperament is somewhat difficult. She won't bark, but she will howl; she'll perform well in public (if properly trained), then ignore your commands once back home; and she'll love you all day but take that one chance when you turn your back to make her escape. You simply must understand the complexities of the Husky characteristics and traits if you plan on living with one. Training can be difficult as you will need to be a thorough alpha or your Husky will simply humor you, if that. 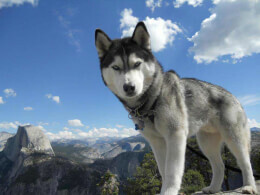 Food is the key to a Siberian Husky's behavior, heart and mind, and he who controls the food controls the Husky. They make lousy guard dogs as they will seek new friends everywhere, including your home. They love to dig, and they can jump rather high. 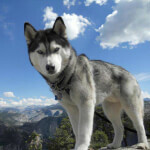 Ultimately, the Husky personality is based in the pack mentality, and they require a social order with them not at the top lest they become unmanageable. They need a lot of attention, they must understand their place in the pack hierarchy (which they will perpetually push to overreach), and they need an active, social outlet for their energy. As this breed has for a few thousand years been accustomed to close-knit, highly social group settings, you'll find that a Husky family dog is a great companion. The history of these dogs is all about endurance, keeping close to humans, and the symbiotic relationship that has been created over the millennia. These dogs love to be part of a family, and a Siberian Husky with kids to play with will be a very happy dog. You should make sure both the kids and the dog(s) are aware of how they should behave around each other, of course, but you'll find that this breed is more amenable to kids than most. As with all breeds, your Husky and baby need constant supervision to prevent any accidents. While your Siberian Husky with cats is not to be trusted too far, these dogs, if socialized very early and constantly, can learn that household cats are not prey. It may take a lot of work to make them also understand that cats don't like to play chase, too, and you may not always be successful. On the other hand, a Siberian Husky with other dogs tends to be an easier situation. Neighborhood cats, squirrels, and other small, furry animals, however, risk being attacked and eaten. Huskies love to run and play, but they absolutely must be constrained via fenced yard or leash. Because Huskies are preferred in a lot of places where horses and cattle tend to be present, some people may be curious if a Husky and horses coexist harmoniously. This can be done, but it requires a lot of hard work starting when the dog is a pup and it may require professional help. Some Huskies may think horses are just big dogs, and other Huskies may insist they are prey. Below are pictures of the Siberian Husky dog breed. Owning a Husky is no easy task. If you are drawn to this dog simply because of their wild, wolf-like looks, you (as a Husky owner) will really need to understand the many responsibilities required to live with this dog. They howl when they are upset, they are independent but they need attention, and they must have a job to keep them from becoming bored, destructive, and overweight. Despite the movies and legends you may have seen and heard, these "wild" dogs are extremely friendly, and they are not good watchdogs or guard dogs. Having a Husky as a pet in an apartment is possible, but there are more concerns than if you have a house with a well-fenced yard for this breed. They need a lot of daily exercise, and they are sure to become a howling nuisance to neighbors if left alone for frequent and / or long periods of time — or they become upset for whatever reason. They are diggers and jumpers, and their demand to have a task akin to what they were bred to do can prompt them to be more rambunctious than usual. They have a strong tendency to roam, and they can't be off-leash when out of the apartment; they are well-known for letting their curiosity lead them into harm's way. Siberian Huskies are in no way hypoallergenic, and while they tend to shed lightly most of the time, they blow-out at least twice a year (sometimes more, depending on the climate). Be prepared to clean up mass amounts of dog hair when they do blow out! As their double-coat provides protection, they should not be shaved unless it's a medical emergency. Those with allergies should consider a Husky mix with the hypoallergenic Poodle (for example). The Siberian Husky Iditarod race is very well known. Started in 1973, the 975-mile race honors the 1925 life-and-death long-haul of a small package of serum which saved thousands of lives in and around Nome, Alaska. The below-average, sub-zero temperatures of March 1925 were nonetheless braved by some 150 dogs and 20 men who relayed the medicine when no other means could be used. A few dogs died, many men and dogs suffered severe frostbite and exposure, and the Siberian Husky named Balto (that led the team onto the home stretch into Nome) was immortalized with a bronze statue that still stands in NYC's Central Park. Because of the Hollywood film and nearly year-long tour (not to mention the statue), history appears to have forgotten the other heroes of the storm, driver Leonhard Seppala and his sled dog (and Husky) leader, Togo. Unlike the other teams, Seppala, Togo, and the team ran a 91-mile leg as opposed to 30 miles, and they did it through the worst of the storm and region. Togo died a few years later in 1929, but his body remains preserved at the Iditarod Trail Sled Dog Race HQ in Wasilla, Alaska. Balto's body ended up in residence at the Cleveland Zoo. These days, his body can be viewed at the Cleveland Natural History Museum. 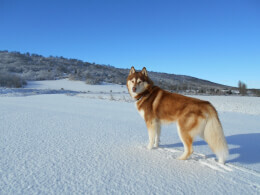 Below are common health issues with the Siberian husky.